WINNER TAKES ALL: Ecstatic members of the St. Catherine High troupe celebrate with their trophy for Best Production. EYE-POPPING costumes, vibrant lighting and a touch of whimsy brought to life their 2017 entry, The Bedbug Monster, which soared on the youthful exuberance of its teenage cast. Indeed, Edwin Allen High put on a well-acted, visually appealing performance that truly merited the award for Best Costume and Set Design. 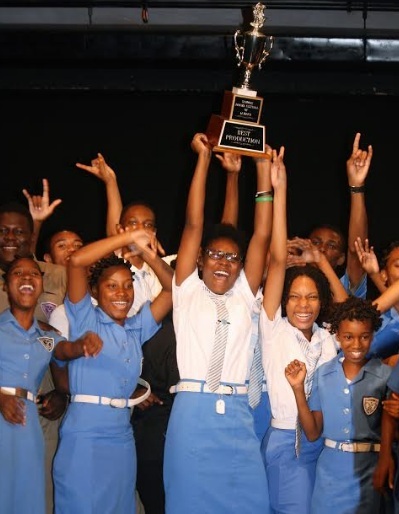 Their moment of triumph was among the highlights at last Wednesday’s culmination of the National Schools’ Drama Festival (now in its 67th year) at the Little Little Theatre in Kingston. Six schools hailing from across the island (St. Catherine High, Ardenne High, Edwin Allen High, Calabar High, Excelsior High and Campion College) performed entries – mini-productions exploring a variety of themes – over the course of two days, in the presence of esteemed judges Pauline Stone-Myrie and Patrick Brown. But only one troupe could walk with the coveted award for Best Production. Edwin Allen’s presentation scored high marks but the judges felt that what St. Catherine High delivered was better. As a result, Drop of Culture took home the top prize. St. Catherine High also won Best Ensemble. Ten awards in total were handed out. Campion College and Excelsior bagged two awards each. The Damion Radcliffe-coached Campionites won Best West Indian Play for The Séance, for which DeShaun Branford was named Best Supporting Actor. Drama tutor Joylene Alexander copped Best Director for Excelsior’s Secrets: The Lawyer’s Wife, while Akalia Simms claimed the Best Actress prize for her part in the production. Meanwhile, the Best Actor prize went to Steven Anderson of Ardenne High, which presented Mundane Heist 2.0, co-directed by Suzanne Beadle and Dania Brown. Their ace student Jada-Ann Walker was awarded Best Supporting Actress. The Calabar High ensemble, led by teacher Canute Fagan, took home the award for Best Provisional Script for Becoming What I Am. Not to be confused with the annual Drama Festival that forms part of the JCDC Festival of the Performing Arts, the National Schools’ Drama Festival (after six decades and counting) is the longest-running programme in Jamaica facilitating the development and expansion of the dramatic/theatrical arts.